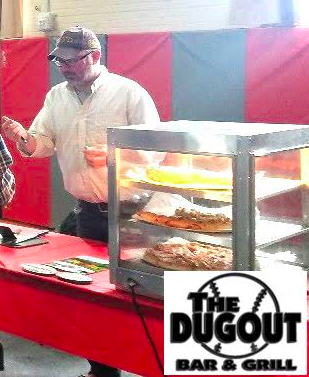 Shaun Riggs of The Dugout offers samples of pizza. FARMINGTON - Approximately 160 people voted in the Taste of Farmington event on April 6 to crown the Best Take-out Pizza in Franklin County. The Franklin County Chamber of Commerce opened the event up to any business that makes pizza in Franklin County. In 2019, The Dugout Bar & Grill was the winner of both categories, cheese pizza and specialty pizza. The Chamber recommends that everyone stop in at all of its local businesses and give the pizza a try. There were five businesses that participated in the event: Arkay Pizza, The Dugout Bar & Grill, Calzolaio Pasta Co., The Homestead Kitchen and Mosher’s Seafood and More. The competition was close by all counts. Beer samples were also offered by Tumbledown Brewing and were a big hit. The Chamber hopes to grow this event next year. Pizza makers that want to participate are invited to look for the organization's posts next year. The Chamber hopes to have more involvement from other businesses that make pizza and that want to show off their business at its Business Showcase. Sponsors of the event were Franklin Savings Bank, NextEra Energy and The Friends of Wilson Lake. Others in attendance were as follows: Sun Media Group, WKTJ, Project Linus, Safe Voices, Maine Wood Concepts/Fletcher’s Mill, Woodlands Senior Living Center, Sparkes Hearing Services, Redzone Wireless, United Way of the Tri-Valley Area, Dreamin’ Fahm and Love Grown. There were live performances by the Clef Notes of UMF, along with Holly Robertson who sang and played her guitar. Maine Wood Concepts/Fletcher’s Mill brought Easter Eggs and painted them with the kids. It went over very well with the kiddos and the adults. Thank you to everyone who turned out to check out local businesses and try some pizza and beer. The Chamber has over 240 members and it takes a commitment from 14 board members to make these events happen. Way to go Shaun! The only thing better than take-out pizza from the Dugout is eat-in pizza at the Dugout!